In recent years, it has become apparent that low-grade vascular inflammation plays a key role in all stages of the pathogenesis of atherosclerosis. Weight loss has been shown to improve blood inflammatory markers; however, it is unknown if weight-loss diets varying in macronutrient composition differentially affect inflammatory responses. 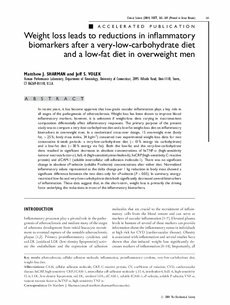 The primary purpose of the present study was to compare a very-low-carbohydrate diet and a low-fat weight-loss diet on inflammatory biomarkers in overweight men. In a randomized cross-over design, 15 overweight men (body fat, >25%; body mass index, 34 kg/m2) consumed two experimental weight-loss diets for two consecutive 6-week periods: a very-low-carbohydrate diet (<10% energy via carbohydrate) and a low-fat diet (<30% energy via fat). Both the low-fat and the very-low-carbohydrate diets resulted in significant decreases in absolute concentrations of hsTNF-alpha (high-sensitivity tumour necrosis factor-alpha), hsIL-6 (high-sensitivity interleukin-6), hsCRP (high-sensitivity C-reactive protein) and sICAM-1 (soluble intercellular cell-adhesion molecule-1). There was no significant change in absolute sP-selectin (soluble P-selectin) concentrations after either diet. Normalized inflammatory values represented as the delta change per 1 kg reduction in body mass showed a significant difference between the two diets only for sP-selectin (P<0.05). In summary, energy-restricted low-fat and very-low-carbohydrate diets both significantly decreased several biomarkers of inflammation. These data suggest that, in the short-term, weight loss is primarily the driving force underlying the reductions in most of the inflammatory biomarkers.